Curable illnesses such as respiratory infections, malaria, and diarrheal disease are all among the top ten causes of death in low-income countries.1 Removing barriers to life-saving medical care is therefore a critical goal for national health systems, and many countries in sub-Saharan Africa have begun to heavily subsidize primary care to achieve it. Yet even as these efforts are underway, another challenge is emerging: that of regulating access in order to prevent the overuse of care. When patients consume unnecessary medical treatment, or get treated for the wrong illness, it burdens public budgets, drains patients’ time and money, and contributes to the rise of drug-resistant diseases that will cost lives in the future, not to mention side effects that may harm the patient. Despite prescription drug systems and licensing requirements for physicians and pharmacists, many, if not most, healthcare systems battle high rates of overtreatment, including in countries where one might think that the main challenge is to provide more, not less treatment. For example, the overuse of antibiotics has been documented in a wide range of lower-income countries (Li et al. 2012). Injections are overused across the developing world (van Staa and Hardon 1996). A large share of antimalarials prescribed at health centres in sub-Saharan Africa go to patients who test negative for malaria (e.g. Reyburn et al. 2004). Matching these patterns, our own work in Bamako, Mali, finds that 58% of malaria-negative patients who visited community clinics for an acute illness received an antimalarial, and a large share of these prescriptions were expensive injections usually reserved for life-threatening complications (Lopez et al. 2018). Why is overtreatment such a pervasive problem? Most of the existing literature focuses on reasons why the prescribing physician may want to overtreat. An important reason is that the doctor’s own income may depend on the revenue from medication sales (Currie et al. 2014). The doctor may also be unsure about correct treatment protocols, or treat preemptively to avoid complications later (Das et al. 2008). But as Kotwani et al. (2010) note, doctors often report that patients pressure them to overprescribe. This is also true in our sampled clinics in Bamako, where over half of the doctors interviewed reported that patients sometimes request unnecessary drugs. This alternative explanation is much less explored in the literature: could it be that patients put pressure on doctors to prescribe certain medications, and doctors acquiesce even though they do not think the treatment is necessary? The main objective of our study on antimalarial overuse is to test the importance of this ‘patient demand’ channel. As we describe below, we do this by randomly varying whether both doctors and patients, or doctors alone, know about a price discount for antimalarials. We focus on (over)treatment for malaria, because malaria is one of the most commonly-treated illnesses in clinics, and a patient can be easily diagnosed with a free 20-minute blood test. Malaria is still the leading cause of mortality in Mali, accounting for roughly 20% of all deaths (IHME 2016), and concerns over parasite resistance to drugs is growing. Malian health policies stipulate that antimalarials should only be prescribed after a positive malaria test result, and free rapid detection tests should be available to all patients (Ministère de la Santé 2013). Mali’s medical guidelines advise the treatment of “uncomplicated” malaria with inexpensive artemisinin combination therapy (ACT) tablets, reserving injections with antimalarials for patients in acute crisis. We conducted a randomised evaluation among 60 public health clinics in Bamako and stationed study staff at each clinic for a two-week period, so we could records details of all acutely ill patients who came to seek treatment, their symptoms, what medications they were prescribed, and what medications they bought. We also visited a share of the patients at home a day later to conduct a malaria test. In total, we interviewed 2,055 patients visiting those clinics. On a randomly selected subset of study days, we offered vouchers for free ACT tablets. In order to test for the patient demand channel, we offered these vouchers in two different ways: on randomly selected “Patient Days”, we gave the vouchers directly to patients when they arrived at the clinic. This way, patients knew that the ACT could be obtained for free before they consulted the doctor. 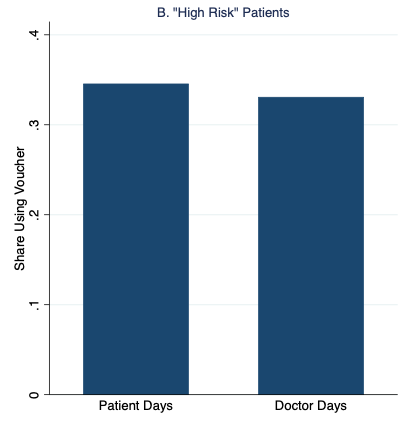 On randomly selected “Doctor Days”, we gave the same vouchers to doctors to dispense at their discretion, without informing patients that treatment was free. On Doctor Days, physicians could choose if they wanted to inform patients of the discount for the ACT. All vouchers provided a discount on the same treatment (ACT tablets for uncomplicated malaria) and had identical appearances, terms, and conditions. In order to be valid, the voucher could only be used on the day of the visit to the clinic and required a doctor’s signature and prescription. Hence, the sole difference between the “Doctor” and “Patient” days was whether patients knew about the voucher before their consultation (and therefore had the ability to actively demand the discounted medication from the doctor). Figure 1 graphs our main results, which strongly support the patient demand channel. 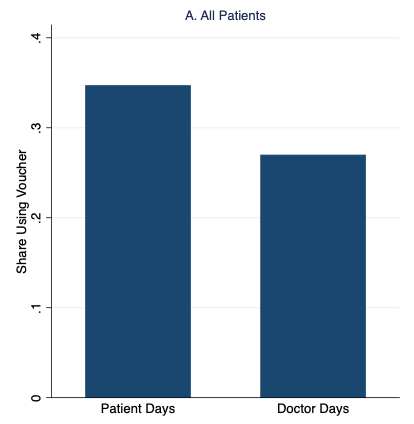 Patients were 35% more likely to redeem the vouchers and receive malaria treatment on “Patient Days” than on “Doctor Days,” with the additional demand entirely driven by patients with the fewest malaria symptoms. Notes: High- and low-risk patients have above- and below-median malaria risk based on reported symptoms, respectively. We also analysed the match between prescriptions/purchases and patient’s malaria status. Building on the subsample of patients who we tested for malaria at home, we constructed a measure of predicted malaria risk (computed by using illness symptoms and patient characteristics recorded in the clinic survey and mapping them to the patient’s malaria status). We then add the probability of a ‘correct positive’, i.e. the probability that a truly sick patient receives an antimalarial, and the probability of a ‘correct negative’, when a patient without malaria does not take an antimalarial, to create a measure of expected ‘match’ of treatment and illness. Our results indicate that, relative to the control when ACTs were sold at the normal price, the voucher treatments improved correct positives for medication purchases by 18-21% (2.1-2.5 percentage points). This result underscores the rationale of subsidising health care: some truly sick patients underuse care, possibly at high risk, and perhaps for financial reasons. On the other hand, we also found that both voucher conditions reduced the likelihood of a correct negative, because more patients without malaria now took an antimalarial. 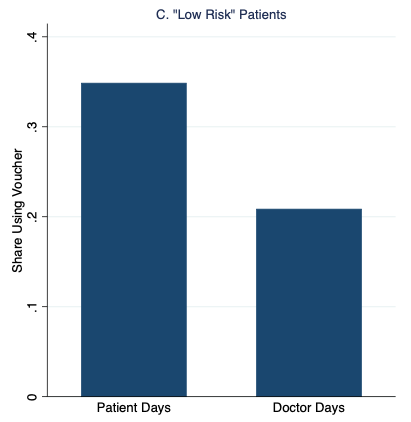 Strikingly, however, while “Doctor Days” decreased the share of correct negatives by 13% (5.9 percentage points), “Patient Days” decreased it by 24% (11 percentage points). Overall, we estimate that on Patient Days there is a decline in the match rate that amounts to a 20% increase in misallocation. By contrast, we found no evidence of doctors attempting to increase treatment rates or intensity. They also do not strategically use information about the vouchers on “Doctor Days” to increase clinic revenue, for example by concealing the voucher (which only covered antimalarial tablets) to ‘upsell’ patients on more expensive antimalarial injections; if anything, injection rates decreased more on Doctor Days than on Patient Days. Our results have some important implications. First, they indicate that doctors and patients don’t always agree about what medications should be prescribed. Moreover, at least in our setting, the disagreement is not always that doctors are eager to sell expensive treatment options that the patients are reluctant to get – an often-invoked explanation for overly costly healthcare and unnecessary treatment choices. Rather, doctors in some cases prefer to withhold antimalarials from patients with low malaria risk. Doctors are only willing to go so far, however. When faced with patients who know that treatment is free, some doctors give in and write a prescription anyway. In other words, the heightened demand from these patients can in some cases exert enough pressure on doctors so that they go against their own professional judgement. What does this tell us about crafting effective health policy? Providing access to highly-subsidised antimalarials is an essential tool to overcome access barriers in the fight against malaria. However, these subsidies can get very costly if doctors do not limit treatment to those who need it. It is therefore critical for policymakers to understand how well doctors fulfil their gatekeeping role – for antimalarials as well as other prescription drugs – and why they fall short. In situations where patients drive overtreatment, interventions that empower doctors and make it easier for them to resist patient demands (like patient communication tools) could help sustain subsidies and reduce overtreatment. In settings where doctors drive overtreatment, on the other hand, policy instruments may be required that limit doctors’ discretion to prescribe or change their financial incentives, such as closer monitoring (e.g. by conducting independent malaria tests) or subsidy reimbursement caps. Further research on doctor-patient dynamics in other contexts, as well as testing of interventions that strengthen doctors’ gatekeeping capacity, will help build on these insights to craft effective policy to advance the fight against malaria. Currie, J, W Lin, and J Meng (2014), “Addressing Antibiotic Abuse in China: An Experimental Audit Study”, Journal of Development Economics 110, 39–51. Das, J, J Hammer, and K Leonard (2008), “The Quality of Medical Advice in Low-Income Countries”, The Journal of Economic Perspectives 22(2): 93–114. IHME (2016), “Global burden of disease study 2015 (gbd 2015) results”. Kotwani, A, C Wattal, S Katewa, P Joshi, and K Holloway (2010), “Factors Influencing Primary Care Physicians to Prescribe Antibiotics in Delhi India”, Family Practice 27(6): 684–690. Li, Y, J Xu, F Wang, B Wang, L Liu, W Hou, H Fan, Y Tong, J Zhang, and Z Lu (2012), “Overprescribing in China, Driven by Financial Incentives, Results in Very High Use of Antibiotics, injections, and corticosteroids”, Health Affairs 31(5): 1075–1082. Lopez, C, A Sautmann, and S Schaner (2018), “The Contribution of Patients and Providers to the Overuse of Prescription Drugs”, NBER Working Paper No. 25284. Ministère de la Santé (2013, August), “Politique Nationale De Lutte Contre Le Paludisme”, Republique du Mali. Reyburn, H, R Mbatia, C Drakeley, I Carneiro, E Mwakasungula, O Mwerinde, K Saganda, J Shao, A Kitua, R Olomi, B Greenwood, and C Whitty (2004), “Overdiagnosis of Malaria in Patients with Severe Febrile Illness in Tanzania: A Prospective Study”, British Medical Journal 329(7476): 1212. Van Staa, AL and A Hardon (1996), Injection Practices in the Developing World, World Health Organization.